Nowdays we are become more free to decide which one that preschool education method best for our children and toddler. Today i will explain about one of modern method of studying for children and toddler aged under five. The method is Singapore Preschool Method. What is The Singapore Preschool Method? Singapore Preschool Method is the preschool approach that center for the sake of children or toddler. 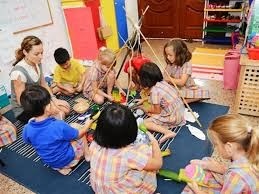 The Classrom and environment that support this kind of Preschool Method designed to be so, when preschoolers arrived at school, so they want to rush for begin the activities, learning something new, and of course learn more about experiment and creativity. Inside the classroom there is one important place, that so called the Learning Corner. While the preschoolers in free time, they may play and make the creative activity in the Learning Corner that they want and pleased for them. From there the Teacher from this Singapore Preschool Method can see the children and toddler interest, potential, and their talent that in future must be developed. How The Singapore Preschool Method Works? For example, the Musical intelligence can be improved by introducing some songs and musical instruments for children and toddler. Logical-Mathematical intelligence can be trained by inviting the preschoolers to use logic to solve some problems, like calculating the number of their friends. Kinesthetic Intelligence can be trained by inviting the children and toddler for make some move like dancing, do sports and playing some games. Intrapersonal intelligence can be stimulated by let the children and toddler make some story or speaking in front their friends. And the last is the Interpersonal intelligence can be improved by taught the preschoolers to behave unselfish, respectful, caring, kind, for others and their environment. Another methods to be taught to this Singapore Preschool Method is the approach of the Project (Project-Based System). Preschoolers were separated into some groups and asked to answer or find some solution about some project according to certain topics. For instance, the project about 'Brain', We let the children and toddler argue or commenting whatever about the 'Brain'. And then let ask them deeply about that topic. The aims of this method are trying to stimulate children and toddler to express their opinions and desires. At the of the project they can make the vary creative things associated to the 'Brain' topic. In this Singapore Preschool Education method, the curriculum put the teacher as a facilitator. Beside their professionalty, they should be warm, care, respect, understanding the preschoolers, and poitive thinking towards children and toddler. Parental support is of course very important. The involvement of parents very important at Family day to support the children and toddler. Singapore Preschool Education Method Is original article written, if you find that Singapore Preschool Education Method is violating DMCA please don't hesistate to contact me http://edutoddler.blogspot.com/2013/11/singapore-preschool-education-method.html, and Thank For Visit Early Learning Methods for Child and Toddler. Thanks for positive taught, we waiting for for the next visit. Wow, amazing, thank you for your info, fantastic ! you are welcome...hope this article useful for you. it;s so nice, child is my love ! Singapore Education Method gave a children to improve the skill in themself..